It's not quite "All Egypt All the Time" on the news channels, but it comes close. Starting with TV and now exponentially so with the Internet, we have become addicted to the fantasy of being on the scene whenever and wherever events of world-historical significance are (or appear to be) occurring. The fact is, however, that how much I know about what's happening in Egypt makes absolutely no difference to anyone or anything. Policymakers, of course, are another story. Naturally, if I worked in the White House or the State Department, I would want to be getting up-to-the minute reports on the Egyptian situation - although even then whether a reactive, crisis-driven response is really in the best interest of the US is still another question. The tragic fact is that - even for policymakers - having up-to-the-minute information ("in real time," to employ the more trendy post-modern idiom) may not make much of a difference either. It might actually do more harm than good, if it results in an obsession with "being on the right side of history" - without, of course, the critical distance necessary to know what history's direction will be. I don't know what is going to happen in Egypt. Does anyone? Of course not! The reality is that the only thing we ever really know about history's direction is the past. The past may indeed (and often does) give us some sense of the likely direction of the future, but then it might not. Nor is the past necessarily univocal. The last Egyptian "revolution" (really a military coup, actually) was the overthrow of the monarchy some 60 years ago, which led to Nasser's pan-Arab "socialism" - a movement which inspired all sorts of havoc in the Middle East. "Pan-Arabism" probably and "Socialism" certainly are outdated ideas unlikely to be able to provide the ideological superstructure for Egyptian policy in the long run. The other obvious - and even worse - precedent from the past is, of course, the 1979 Iranian revolution, which replaced another reliable American ally and force for stability in the Middle East with a radically anti-American, anti-Israel, Islamist tyranny. The world may dodge that particular bullet this time - if we're lucky. But, even if Egypt escapes Iran's radical fate, it is hard to imagine any particularly positive outcome from change in Egypt. Ever since Sadat made peace with Israel, Egypt has been a significant stabilizing force in that region. Egypt's ceasing to play that role would be an outcome hardly to be overly welcomed. So the bottom line is no one really can know what is going to happen, but past experience suggests whatever happens will likely make things worse. There's still lots of snow on the ground - though, of course, in classic New York fashion the street corners are now mainly puddles of cold wet slush. Walking around on Thursday, I went home at one point just to change my socks and dry my feet! But then I went out again for dinner and a movie down on Houston Street. At my age, one walks carefully on snow and ice. But in New York one still keeps walking. Were it not for having to navigate the slush, I'd probably have walked even more and done some of the shopping I had originally planned on doing. Even so, I'm sure I have walked more here in one week than in an average month at home. Walking is good. Three cheers for urban life that allows such luxuries as walking! What with walking, eating, catching up with some friends, and the fun of spending Saturday morning with the New York Times Sunday Magazine and Book Review, I've still managed to make time to compose an appeal talk for this weekend. It's something I have never had to do before and have no real template to draw upon. But that may be just as well! I get to talk about where I am now, connecting the IC story and the Paulist mission in Tennessee and across America, within the larger narrative of how Hecker's vision that proclaiming the truth of Catholic faith would be a calming oil poured upon the troubled waters of our world. I confess I’m feeling a little bit like that monk, being back at the Paulist Mother Church in New York (in my old room even) after almost six months. In fact, it will be exactly 6 months ago tomorrow that I celebrated my final Mass at St. Paul's - a joyful Mass of Thanksgiving for 10 blessed years as associate pastor. Now, tomorrow I am scheduled to celebrate Mass here again - for the feast of the Conversion of St. Paul, the patronal feast of this church, this parish, and the Paulist community. In 1858 (three years after my present parish - Immaculate Conception in Knoxville, TN - was established), Servant of God Isaac Hecker and three other ex-Redemptorists founded the "Society of Missionary Priests of St. Paul the Apostle," known ever since as “The Paulist Fathers.” The Archbishop of New York assigned the new community the care of a new parish to be created on the west side of Manhattan – the parish, like the community itself, placed under the patronage of St. Paul the Apostle. For over 150 years, the Paulists have ministered here in this parish, the life and mission of both the Paulists and the parish being intimately tied together, and both blessed by the patronage of St. Paul the Apostle, the feast of whose Conversion we celebrate this week. For 126 of those years, the spiritual center of this parish has been its big beautiful church. Within Stanford White’s golden dome above the High Altar is a verse from the Divine Office for St. Paul's feast: “You are a vessel of election, holy apostle Paul.” The response, “Preacher of Truth in the whole world,” is inscribed in the mosaic on the floor at the foot of the sanctuary steps. For the 1st century or so of this church’s life, communicants coming to the altar rail would see that mosaic, designed in 1920 to highlight the symbols of St. Paul’s apostleship – the book, open to St. Paul’s letter to the Ephesians at the verse, To me, the very least of all the holy ones, this grace was given, to preach to the Gentiles the inscrutable riches of Christ, and the sword, the symbol of St. Paul’s martyrdom. Over at the west end of the south aisle, over the altar dedicated to St. Paul, is Robert Reid’s evocative painting of Paul kneeling calmly and confidently awaiting his imminent martyrdom. Above and below are the famous words from his Second Letter to Timothy: I have fought the good fight, I have finished my course. I have kept the faith! The event we commemorate this week – the decisive turning-point in Paul’s life – is portrayed above the main entrance to the church in a monumental frieze by Lumen Martin Winter (who also designed the equally monumental tomb at the east end of the north aisle, in which Isaac Hecker was re-buried 52 years ago today). Commonly called Paul’s “conversion,” that event transformed Paul into a disciple of Jesus and an apostle on equal footing with the others, an apostle sent to evangelize, that is, to make disciples of all peoples and nations without exception. That mission is the theme of the other floor mosaic, at the main entrance of the church, which recalls Paul’s preaching outreach to the Greek world in 1st-century Athens. Paul was not one of the original 12. He wasn’t there when Jesus said to his disciples: “Go into the whole world and proclaim the gospel to every creature.” But he absorbed those words as surely as if they had been addressed to him initially – as we also must do. That’s what the Paulist Fathers are for, focusing on the Church’s evangelizing mission in an intentional way, continuing the work begun by Isaac Hecker to proclaim the truth of Christ and the Catholic faith throughout this country. The Annual Paulist Appeal (which I am here to preach this coming week) will enable today’s Paulists and the Paulists of tomorrow (whose seminary training the appeal helps support) to continue Isaac Hecker’s mission – here in New York, in East Tennessee, and throughout the North American continent. Galilee is a rather small and relatively unremarkable place. Israel and its enemies have been fighting each other for it for over 6 decades, of course, and before that others had fought over it for centuries. But, to outsiders, it must still seem a somewhat insignificant, little place. So it must have seemed in Jesus’ time too. Then, it had only recently been resettled by Jews after several centuries of having had a predominantly Gentile population. Hence, we have Isaiah’s reference to it as the District of the Gentiles [Isaiah 8:23]. In modern terms nothing is very far from anything else in that part of the world, but to the religious establishment in Jerusalem Galilee was no doubt far enough. It just wasn’t the sort of place where religiously significant things would normally be expected to happen. Nowadays you can go for a ride on the so-called “Jesus Boat” across the Sea of Galilee and get a demonstration of how the fishermen of Jesus’ time would fish, casting a net into the sea. Perhaps to us, de-natured city-folk, that may seem exotic, but it’s really quite ordinary stuff. But to say to two fishermen busy earning a living, “Stop what you’re doing, and come and join up with me,” that’s anything but ordinary. Perhaps the only thing more extraordinary about it was their response: At once they left their nets and followed him. Simon and Andrew’s surprising response was then quickly imitated by two other brothers, James and John – and, after them, by many others in the 20 centuries since then. All of us, in fact, are here today because somebody somewhere took Jesus up on his offer – often because again God did unexpected things in unexpected places with unexpected people. It’s too bad that “National Vocation Awareness Week” was 2 weeks ago. Today’s Gospel could be a Vocation Director’s dream text! When we in the Church use the word “vocation” or “calling,” we often use it in multiple, somewhat overlapping senses. Sometimes, we are speaking of the call of everyone to live a holy life as a disciple of Jesus in the Church – everyone’s vocation (as my High School Commencement speaker said some 46 years ago) to become a saint. At times we also use the word when speaking of different ways of life of living life in the world. Finally, we also use the word in a particularly precisely sense to refer to the particular calling of some of the Church’s members to live lives publicly identified with the ministry of the Church – as bishops, priests, deacons, or as members of what we call Institutes of Consecrated Life or Societies of Apostolic Life. In the case of the first four apostles, whose story we just heard, these varied meanings all came together in one encounter. Called by Jesus himself to be his disciples, to follow him to holiness, Simon and Andrew and James and John were also called to their life-long, full-time work as apostles, official leaders in the Church. Like them, we all need to listen and to respond. In this “Information Age,” we have all become accustomed to being deluged by all sorts of information we have no real need for and no useful way to process. So now we even have mechanisms on our computers to filter out at least some segments of it. We can even hide or ignore some of our hundreds of Facebook friends, when their news becomes too much to absorb. With all the information coming at us from so many directions, it may be increasingly difficult to imagine hearing something that really matters, something that may actually be worth listening and responding to. But God doesn’t give us information. He doesn’t update his status. He calls us directly and personally to a relationship with him, and then invites us to share in his work in our world. We all need to listen to him and to respond. To do so, we rely on the Church to help us filter the noise and to listen to God’s call and so be better able to respond. And, as members of the Church, we all need to be ready and willing be there for one another, helping one another to listen – and to respond. More than just an occasion to wear violet vestments midway between Advent and Lent, this annual National Day of Penance is an opportunity to reflect on a wrong turn taken by our country in 1973. January 22 challenges us to speak truth to power – the truth of the inviolable dignity of every individual human being from the moment of conception. That we do this is essential to who we are. How we do it is also critical to our witness, for how we witness also expresses who we really are. The Dred Scott analogy easily comes to my mind – as it immediately did to one of my classmates on this day 38 years ago at dinner in Princeton’s Proctor Hall. Reflecting on that, I recently re-read President Abraham Lincoln’s Second Inaugural Address. Delivered March 4, 1865, as the American Civil War was winding down and barely 6 weeks before his own assassination, Lincoln’s Second Inaugural articulated his attempt to reflect upon the tragic circumstances of the Civil War and to situate it morally in relation to the national sin of slavery. Fondly do we hope, fervently do we pray, that this mighty scourge of war may speedily pass away. Yet, if God wills that it continue until all the wealth piled by the bondsman's two hundred and fifty years of unrequited toil shall be sunk, and until every drop of blood drawn with the lash shall be paid by another drawn with the sword, as was said three thousand years ago, so still it must be said "the judgments of the Lord are true and righteous altogether. It is always problematic to pronounce in moral terms about political events - and even more so to suggest a causal connection between bad things that happen in the Body Politic and some sort of divine judgment. All too often has that mistake too easily been made. It is perhaps a perennial temptation - if one takes seriously the fact that we do indeed all stand under divine judgment for our sins - to claim perhaps too much knowledge of the mind and judgment of God. January 22 indeed challenges us to speak truth to power – the truth of the inviolable dignity of every individual human being from the moment of conception – and at the same time, like Lincoln, to strive to maintain the fragile human bond that unites us all, despite our disagreements. The other night some of us in the house watched a DVD about the creation of Oak Ridge, TN, during World War II – a critical component of the American war effort that led directly to the production of the first atomic bomb and thus to victory over Japan and peace after years of devastating war. Inasmuch as Oak Ridge is still very much there, seeing how Knoxville’s famous neighbor became what it is has current relevance as well as historical interest. But there was something else – also quite currently relevant – that struck me as I watched the program. That was the sheer size and scale of the project, starting from scratch, quite literally creating a major research facility and an accompanying city (with all that entails) on what up until then had been Tennessee farmland. Of course, the entire American war effort in the 1940s was, by any standard, just such a monumental undertaking, mobilizing the resources and skills of an energized population. What struck me, of course, was how hard it would be to do something like that today – how hard even to imagine such an undertaking. Why should that be? It’s tempting – too easily so - to answer that we were then an empire on the rise and are now an empire in decline. Even if that were unambiguously so, that still just begs the bigger question: why? The Erie Canal, victory in World War II, the space program, and countless other great enterprises of which Americans used to be justly proud were possible because of a vibrant public sphere – now sadly increasingly shrinking. A couple of days ago, with some real reluctance, I started removing the Christmas decorations in my office and putting my Peruvian nativity scene in storage for another 11 months. Christmas is my favorite time of year, and I never like having to end it. But, as I was recently reminded, it is mid-January already! Granted, January is not a very exciting month. Coming right after the big holiday month of December, the comparison with Christmas makes January just seem so – ordinary. In fact, it virtually screams ordinariness! Those of us who are above a certain age will, of course, remember when these green mid-winter Sundays were counted as “Sundays after Epiphany” – certainly a much more festive-sounding title, which also had the added advantage of more clearly connecting what we are doing here and now with Christ’s having revealed himself to the world. (Likewise, calling the green-colored Sundays of summer and fall “Sundays after Pentecost,” as we did for so many centuries, made the connection more obvious with the Church’s on-going mission in the present). Traditionally, the idea of the Epiphany connected 3 important events – Christ’s manifestation to the non-Jewish world, symbolized by the 3 Wise Men; his manifestation as Son of God at his baptism by John; and the manifestation of his glory to his disciples at the wedding at Cana where he miraculously changed water into wine. Of those three, it was Jesus’ baptism (commemorated officially last week), which marked his first public appearance as an adult, the beginning of his public life and ministry, the formal start of the work he came into the world to do. In linking Christmas with “Ordinary Time” in the Church’s calendar, the baptism of the Lord links his coming into the world then with our time today, with the ordinary lives we all live here and now in the present. Today’s Gospel [John 1:29-34] gives us a kind of extended meditation on what actually happened when Jesus was baptized – and what that actually has to do with us, who (as we just heard St. Paul say) have been called to be holy [1 Corinthians 1:2]. At his baptism, God the Father formally identified Jesus as his Son and symbolically anointed him for his mission – not with oil, as kings and queens and bishops and priests are anointed for their mission, but with the Holy Spirit himself. John testified that he did not know Jesus, until he saw the Spirit come down like a dove from heaven and remain upon him. Whatever John may have already known or not known about Jesus in human terms, it was only after Jesus’ baptism that John really got to know Jesus as who he really is – the Son of God, who existed before him. Jesus took the initiative to come to John – and not just to John, of course, but to all of us as well, to the whole world, in fact, whose sin, he the Lamb of God, has come to take away. At our own baptism, we in turn identified ourselves with Jesus, so as to be united with him in a new relationship with God and with the world – as adopted children of God the Father, through the power of the Holy Spirit. In the words of Paulist founder, Fr. Isaac Hecker: “In proportion as the Holy Spirit takes possession and direction of our soul will our intelligence increase in light, our hearts in love, and our will in liberty” [Notes on the Holy Spirit, 1870s-18880s]. The same Holy Spirit, who identified Jesus as the one who takes away the sin of the world, that same Holy Spirit remained upon him eventually to be passed on by the Risen Lord to his disciples with the injunction to be agents of that very same forgiveness – something certainly as much needed in our contentious and troubled world today as it was in Jesus’ day. All who call upon the name of our Lord Jesus Christ [1 Corinthians 1:2] share in that great experience of forgiveness, through which Jesus has come to us as he once came to John. Jesus is, in person, God himself coming to us so that we can come to know God and what God is enabling us to become, forgiven people who have thus been empowered to become people of forgiveness. If Christmas was all about Jesus’ initial coming into the world, “Ordinary Time” – our time, our ordinary time day-by-day, here and now – is the time for us to continue to get to know him. Doing that is a life-long task – which fills the ordinariness of life with the most extraordinary possibilities. Homily for the 2nd Sunday in Ordinary Time, January 16, 2011, Immaculate Conception Church, Knoxville, TN. The President regained his voice in Tucson Wednesday night. That's good for him, of course, for his popularity, and in due time for his administration's programs. Even more, it is good for the country. The American President is, by design, a combination king and party politician. Whenever a President plays king well - as Bill Clinton so memorably did in Oklahoma City in 1995 and President Obama did in Tucson this week - the country is invariably the better off for it. As others have already pointed out, while the President played his part perfectly, the overall atmospherics of the event left something to be desired. Granted, the amazing announcement (delivered by the President himself with ultimate dramatic effect) that Rep. Giffords had just opened her eyes certainly warranted cheers and genral jubilation. Apart from that spontaneous response, however, the general pre-game rally atmosphere seemed somewhat jarring - at least to someone of my age who can remember when sobriety and dignity still characterized our public ceremonies. (The often repeated contrast between the 1965 funeral of Sir Winston Churchill and the 1997 funeral of Diana, Princess of Wales, quickly comes to mind as representing the two opposite poles). My point in mentioning this is not to carp critically about the esthetics of what was undoubtedly an overwhelmingly positive experience for Tucson and for the entire country, but rather to wonder whether we can actually muster the internal resources to reverse the direction we have been headed in and really recover for the long term some of that sobriety and dignity - and "civility," to use the popular word of the moment - that we will need as a nation if we are ever to extricate ourselves from the present impasse. The problem, of course, is that we remain a fundamentally polarized people. Resolving such deep-seated differences through rational deliberaiton and debate is difficult - all the more so when the value of deliberation and debate, not to mention rationality have been widely disparaged. Exactly 150 years ago, it proved completely impossible to resolve our differences as a nation, and matters were settled only through a painful, prolonged civil war. Imposing solutions by force of arms is a time-honored practice which has often been quite successful in producing desirable results in the limited terms that define success this side of the eschaton. Contrary to what is sometimes claimed, wars often produce the optimal solution. Even overwhelming military victory does not always fully defeat bad ideas, however. Hence the persistence, a full 150 years after the Civil War, of vehemently anti-national, pro-states rights sentiments in our society. So we are still very much a divided people. Whether the issue is saving health care insurance reform or protecting the citizenship rights of American born children of immigrants the road ahead will be a difficult and challenging one. I recently read Ron Chernow's new biography of George Washington. One of the things that really stands out about Washington's character was how hard he worked at keeping his emotions in check and maintaining a posture of distance. Among Washington's many admirable qualities, this was clearly key to his success - and to the esteem and veneration in which he was held by his contemporaries. Have we evolved as a culture to such a state that a Washington would now be incomprehensibe and unimaginable? What to Say about Arizona? Back when I was in High School in the early 60s - in the glory days of the Civil Rights movement - the faraway (in more ways than one) states of Alabama and Mississippi seemed (to my adolescent analysis) to be some kind of national embarrassment. Eventually, of course, I came to understand that much of what seemed so problematic about those particular places was at most a more extreme version of a nationwide challenge. After all the attention Arizona has gotten in the last year or so for some really reprehensible legislation, one might be tempted, in the wake of Saturday's fatal tragedy, to wonder what to say about Arizona. All the more reason, therefore, to be cautious and deliberate about one's response - easier said than done, of course, in a culture characterized by instant analysis and increasingly polarized into opposing factions that are not inclined to listen to one another and are increasingly disposed to accept as facts whatever seems to supports one's group's beliefs (and often only whatever supports one's group's beliefs). Archbishop Dolan also addressed the larger, particularly public significance of this event beyond the personal tragedies involved,: “When the target of a violent act is a public official, it shakes the confidence of the nation in its ability to protect its leaders and those who want to participate in the democratic process." It is, of course, that very "democratic process" that has been so corrosively threatened by all the rancor and name-calling by both sides in our apparently unending culture war. The "democratic process" presumes not just that citizens will refrain from violent acts but also from the moral demonization of one another that has become all too common a substitute for reasoned discussion. Perhaps, we as a society have been so widely infected by a "post-modern" suspicion of others' underlying motives that it is increasingly almost impossible for ideologues on either side to respect the sincerity and good will of those they disagree with. So, perhaps, the question should be not what to say about Arizona but what to say about salvaging the requisites for citizenship and a workable political community. Last Sunday, we celebrated Epiphany, one of the greatest festivals in the Christian calendar. Of course the way we celebrate Epiphany nowadays, one could easily miss its importance. One would, however, probably come away with the impression that, if Epiphany is about anything, it is about – and only about - the Three Wise Men. Epiphany, however, which, by the way, is actually the oldest festival of the Christmas season, older even than Christmas Day itself, has from the beginning been a multi-themed celebration. In the Eastern Churches, where the story of the magi is heard on Christmas Day, Epiphany’s focus is primarily on Jesus’ baptism by John. In the west, we do the magi on Epiphany and concentrate today on Christ’s baptism. In today’s world, of course, Christmas has already long ago fizzled out (after having gone on almost non-stop since Halloween). So today’s celebration may seem simply like some vestigial post-Christmas afterthought. Actually, however, the intent is to highlight the baptism of Jesus as the event, which the whole Christmas season has been leading up to – a kind of glorious grand finale of the entire Advent-Christmas season. Jesus did in fact come to John, blending into the mass of anonymous sinners that stand for all of us. By being baptized as one of them – one of us – Jesus showed the point of his being born in the first place, anticipating already at his baptism what his whole life and mission would be all about. The entire Trinity manifested itself as Jesus began his public life being officially identified by the Father as his Son, anointed, as St. Peter put it in today’s 2nd reading, with the Holy Spirit and power [Acts 10:34:38]. Through the Sons’s gift to each of us of that same Holy Spirit, each of us has become identified with him, so as to share in an analogous way in Jesus’ relationship with his Father. Thus, the baptism of Jesus anticipates the baptism that has elevated each of us to a new status as adopted sons and daughters of God the Father, empowering us to continue Christ’s life and work in the world through his Church. Of course, the theme of today’s celebration is not primarily our baptism but Jesus’ baptism – and even more so the revelation that followed after Jesus was baptized, a revelation (an “epiphany”) of his status as the eternal Son of God, through whom we get a glimpse of the hidden inner life of the Trinity, now suddenly being revealed in what God is doing for us, through his Son in his mission – which is now the Church’s mission and hence our mission - in our world. That Creed that we profess is good news for us – and good news for the world. The Creed is not just an identity badge. Much less is it a weapon for hitting other people over the head with. It is, in summary, the good news which we are commissioned as Church both to proclaim and to share with the world – and to do so with real confidence in its liberating power, the transforming power of God’s Holy Spirit, visibly present in Jesus, God’s beloved Son, through whom we too have become beloved as well. Being beloved, of course, carries certain responsibilities. Today, the Church in the United States begins National Vocation Awareness Week, a week in which the Church highlights what we need to be doing all the time – praying for, promoting, and supporting the vocations of married and single people in all walks of secular life, the vocations of committed men and women who consecrate their lives as religious brothers and sisters, and, in a special way – if the Church in this country is going to be able to continue its mission and not shut down – the vocations of those who offer themselves to the Church and are in turn then called by the Church to serve as ordained priests and deacons. Jesus’ baptism can itself be seen as a kind of vocation story – not in some psychological sense, as if Jesus were some young adult trying to discern who he is and what to do with his life. After all, the gospel is not a novel! But Jesus’ baptism can be seen as a kind of vocation story in which the events of his baptism and the epiphany that followed reveal to us the total trajectory of Christ’s life. Having let us in on that mystery, the story of Jesus’ baptism now challenges us to identify ourselves with him and acknowledge the intended trajectory of our own lives – and to respond accordingly. Homily for the Feast of the Baptism of the Lord, Immaculate Conception Church, Knoxville, TN, January 9, 2011. They read the Constitution of the United States out loud in the House of Representatives yesterday. They read it ceremonially, with different members from both parties taking different parts. It made for a nice ritual. I am a great fan of civic rituals. One doesn't have to buy into Rousseau's ideology to recognize the value - indeed necessity - of civic rituals to articulate what a community is about and to strenghten community bonding against the stresses that threaten it. That's one reason why it is so problematic to tinker too much with the form and flow of established rituals, religious or secular. So perhaps it would be a good thing to institutionalize the reading of the Consitution at the beginning of each new Congress. That said, what was actually accomplished by yesterday's ritual? The participation by members of both parties prevented it from being the purely partisan theater it might otherwise have been, but the event itself still reeked of partisan theatrics. Partisanship, per se, is not necessarily a bad thing, of course. In the spirit of our founding document, however, it is not inappropriate to recall that the Founders themselves abominated political parties - "factions" as they tended to call them. Of course, the same Founders formed the first parties, and partisan rancor has been a regular part of our American political culture from the very start. In a letter he wrote on June 15, 1790, after little more than a year in office, President George Washington lamented that "the questions of assumption [Hamilton's plan for the Federal Government to assume the States' debts], residence [the controversy over where to locate the permanent national captial], and other matters have been agitated with warmth and intemperance, with prolixity and threats." A lot of words have been spoken and written recently about the excessive partisan rancor of today. Sadly there is much truth in that. As others have noted, the creation of a commuter government in which, instead of living in Washington with their families as congressmen did no tso long ago, they now commute back home every week undoubtedly has contributed a lot to the current malaise. Instead of living nearby with their children going to the same schools and socializing together, congressmen today have to fly "home" to raise money by demonizing their fellow congressmen from the other party. It will take a lot more than a ceremonial reading of the Constitution to correct any of that. An attentive reading of the Constitution could be a useful learning experience, however. Whether anyone is capable of actually learning anything anymore is an open question, however. So, along with the reading of the Constitution, we also have the sorry spectacle of the majority party's ideologically driven willingness to ignore the nonpartisan budget office's calculation that the Republican plan to repeal the health care law would add billions to the federal deficit over the next decade. Both parties could actually learn a lot from an attentive reading of the Constitution. Republicans could re-learn why the document was written in the first place - in order to form a more perfect union, establish justice, etc. The document they desire to honor with such ceremony would never have been written had it not been necessary to provide a foundation for a stronger, more effective, truly national government transcending the inadequacy and malignant pettiness of state governments. On the other hand, Democrats (and the Imperial Judiciary many liberals have enthusiastically supported) could do well to re-learn that, however, strong, effective, and energetic government is genuinely intended to be, it is inherently limited in its nature and purpose. It does not replace civil society and is not the origin or creator of fundamental human rights and such fundamental human institutions as marriage, family, etc., all of which existed prior to it and have a moral standing superior to it. So by all means let's encourage everyone of all political persuasions to read our Constitution! Delete 3 out of 4? Earlier today, this "12th Day of Christmas," I celebrated Mass for a group of young people in our religious education program who are preparing to be confirmed this coming spring. Taking advantage of the fact that school doesn't resume after Christmas vacation until tomorrow, they were having a "retreat day," all very well planned and executed from what I could tell. It was a joy to be there and to be part of the day's activities. Back home now, as another blanket of thick white snow descends on Knoxville, that joy is somewhat tempered, however, by the haunting image of the Church's apparent inability to hold onto young people in their 20s and 30s. To bring the point home further, I just got an ad today for a conference that begins: "Twenty-somethings raised as Catholics are swelling the ranks of the religiously unaffiliated. Even those who continue to identify as Catholic are regularly absent from the pews and are likely to judge faith less important in their lives than did their parents and grandparents." It is seriously estimated today that perhaps as much as 60% of Americans who were raised Roman Catholic have either left the Church entirely or remain nominally identified but do not practice. The main reason the Catholic Church continues to hold its own at 24-25% of the US population is because its numbers continue to be augmented by (predominantly Latino) immigration. (Approximately 1/3 of US Catholics and nearly 1/2 of those under 30 today are Latino). Not just the Catholic Church, but Christian churches in general seem to be experiencing this pattern of decline. Between 1990 and 2008, the percentage of "nones" - Americans self-identifying as "no religion - almost doubled from 8% to 15%. Meanwhile, younger Americans appear to be in the vanguard of this movement, dropping out of church in unprecedentedly high numbers. Whereas, in 1990, 11% of 18-29 year-olds claimed no religion, 22% did so in 2008. Literally putting faces on the numbers, one analyst has suggested taking a group photo of teens in one's church and then crossing out 3 out of every 4 faces in anticipation of what will likely happen to their church identification in their 20s and 30s! It is, of course, true that young people traditionally have been less anchored in church than their elders - just as traditionally they vote less, etc. On the other hand, it does seem to be the case that young people are dropping out religiously at higher rates than previous generations. Perhaps more ominous is the evident change in the pattern of young adulthood. It used to be that by their early to mid-20s, most young people were working and settled down in marriage and a career or in the process of doing so. (For young men in the post WW II era, the experience of military service also functioned for many as a widely shared transition to stable adulthood). All that has so obviously changed. If once upon a time marriage and parenthood tended to re-anchor young people in church, today's prolonged adolescence/young adulthood and the delay in getting married and settling into a career path have put into question those old expectations. And the group that seems to be being left behind in terms of educational and economic opportunity and opportunities for marriage is also the socio-economic class that is less likely to go to church. So what do we need to be doing to stem this tide and change these patterns? Yesterday at noon, the 111th Congress of the United States expired. Its acomplishments have been somewhat overshadowed by last November's election and the particular partisan spin that the winners (with the connivance of the media and the passivity of the losers) have given to that election. That said, the 111th Congress was an amzingly productive one. Its legislative accomplishments include the Lilly Ledbetter Fair Pay Act, the 2009 Stimulus Program, the 2010 Health Care Reform, the Healthy Hunger-Free Kinds Act, the "Tax Relief, Unemployment Insurance Reauthorization, and Job Creation Act of 2010," the repeal of "Don't Ask, Don't Tell," the "Food Safety and Modernization Act," the ratification of a new START Treaty, and countless other important but barely noted legislative acts. Historians will undoubtedly debate whether or not this was the best way to attempt to resolve our increasingly unsustainably expensive system of allocating health care. Perhaps, we would have been better off in the long run if President Nixon had succeeded back in the 1970s in universalizing Medicare. Of course, Medicare may itself eventually prove unsustainable in its present form, but universalizing it would only have exacerbated that problem and moved its urgency forward in time, which might possibly have been a good thing. Anything that forces us to face up honestly to the mess we have unjustly chosen to bequeath to future generations is, to that extent at least, laudable. Whatever happens in regard to any particular legislation, one would like to believe that the 112th Congress will in fact finally start facing up to some of our fundamental social problems . Whether that is a realistic hope, given the almost complete breakdown of our civic culture in recent decades as each of our two great political parties has become ideologically narrower and more militantly so, remains to be seen. The broad coalitions that were the American political parties of my formative years are effectively gone, and with them most of the axioms of the political science I studied and taught earlier in life. Neither party seems capable of offering a compelling vision of a good society - let alone how to get from here to there. In terms of the foundational political divide that has set the general terms for political debate throughout most of American history, I suppose I remain more or less a Hamiltonian in continuing to affirm the desireability of an effective and "energetic" government (albeit limited in its ultimate range) to foster the kind of civil society that is most conducive to the security, prosperity, and social and moral well-being of citizens. But do we want to be citizens anymore? Some 6 years ago this coming summer, I had the great privilege of accompanying a group from my New York parish to World Youth Day in Cologne, Germany. The great Gothic cathedral in Cologne (the model for New York's St. Patrick's Cathedral) was originally built to house the relics of the magi, who, as we just heard [Matthew 2:1-12], came from the east to do homage with gifts of gold, frankincense, and myrrh. The relics of the magi were supposedly brought to Cologne on July 23, 1164, and the cathedral quickly became one of medieval Europe’s major pilgrimage destinations. Entering our church today, one will have notice an alteration in the nativity scene, where the shepherds have been joined by the long-journeying magi. As our contemporary Christmas holiday has expanded to encompass all of December (and even November), Epiphany (to the extent it gets any attention at all) seems more and more like some sort of vestigial afterthought, a kind of out-of-sync-with-our-culture postscript to Christmas. In fact, however, Epiphany is actually the oldest festival of the Christmas season, older than Christmas Day itself, and still ranks as one of the principal festivals of the Church’s calendar. To add insult to injury, however, here in the United States, the already overshadowed feast has been bumped from its proper day on January 6 to the nearest Sunday – thus reducing the proverbial “12 Days of Christmas” this year from 12 to a mere 8! In the Eastern Christian Churches, Matthew’s Gospel story about the magi is read on Christmas Day, and Epiphany is primarily a commemoration of Jesus’ baptism, the beginning of his mission as an adult. 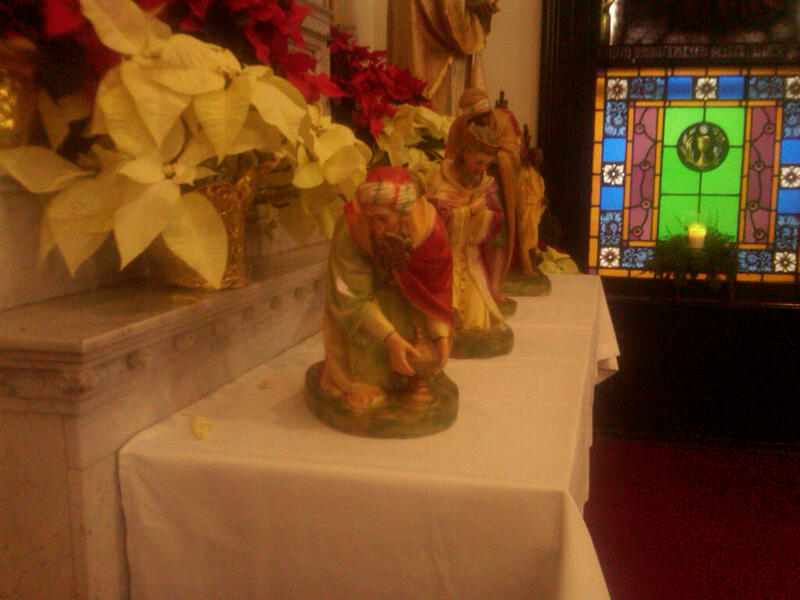 In the West, we will celebrate Christ’s baptism next Sunday, and focus today almost exclusively on the magi. That said, the fact is the we actually know next to nothing about the magi themselves – not their names (although tradition has given them the familiar names, Caspar, Melchior, and Balthasar), nor their number (though tradition, based on the gifts itemized in the Gospel, has counted them as 3), nor their exact social status (though tradition, inspired in this case by Psalm 72, has crowned them as kings). The Gospel tells us none of these things, but it does tell us what it is important for us to know about them. First and foremost, it tells us they were foreigners, that is, Gentile pagans. As such, they represent the multitudes of people – past, present, and future – armed with only natural knowledge, who seek the God who made the world and all that is in it and gives life and breath to everyone, as St. Paul put it in his only recorded sermon to a Gentile pagan audience in the Acts of the Apostles [Acts 17:24-25]. But then the story also tells us that, whatever varied paths different people may start out on, our paths must finally converge in Jesus, the one savior of the world, and that the interpretive key to the story of Jesus is God’s revelation of himself in the history of Israel. Thus, it was to Jerusalem, that the Magi came to learn the full significance of the star – a meaning revealed in the Jewish scriptures, which translated the natural light of a star into the revelation of a person. As Isaiah prophesied in today’s 1st reading [Isaiah 60:1-6]: Nations shall walk by Jerusalem’s light, and kings by her shining radiance. By way of warning, however, the story also illustrates how easily we may miss the point. When Herod heard the magi, he was greatly troubled and all Jerusalem with him. Notice, they were not overjoyed like the magi, but troubled! What troubled them? What made such good news seem like bad news? And then there were the scholars whom Herod consulted. They quoted the scripture correctly, but they just didn’t get it. For all their abundant academic knowledge of the subject, they seemed to lack any real knowledge of the kind that mattered. So none of them did they obvious thing – go to Bethlehem and do Jesus homage. Only the pagan magi did that! The magi, on the other hand, were overjoyed, not troubled, and so set out as true pilgrims – and on entering the house they saw the child with Mary his mother and prostrated themselves and did him homage. In the old liturgy, everyone was directed to genuflect at those words – as if to bring the point of the story physically home and so cause us to identify personally with the pilgrim magi. Every January, after the holidays, we return, as we inevitably must, to our ordinary routines – at home, at school, at work, wherever and whatever. Like the magi, however, our challenge is to travel through our ordinary life by another way, because something so special has happened that makes everything different from what it would otherwise have been. Before there were funeral homes to print parish calendars, Epiphany became the annual occasion in the Roman Liturgy to announce the date of Easter and other important dates in the coming year. None of us, of course, can even begin to foresee what this new year – the Year of Our Lord 2011 – will bring, whether for better or for worse. If this harrowing 1st decade of the 21st century has taught us anything, it should certainly have taught us at least that! Yet, even as we navigate our way through an uncertain, but certainly challenging present, the Christmas star invites us to imitate the magi – to go on pilgrimage with them to Bethlehem and back again – confident that, whatever else may be the case, the Christmas star will precede us to illuminate every new day of this new year, and so will guide us, first to Christ, and then through Christ on that new way, which, like the magi, we are all of us being invited to find and to follow. Homily for the Epiphany, Immaculate Conception Church, Knoxville, TN, January 2, 2011. Minutes, hours, days, weeks, months, and years – our fascination with time is itself apparently timeless. It may be one of our most distinctly human traits since probably one of the earliest things human beings became aware of was our own mortality – the fact that we live and die in a set period of time. Of course, most of that time is what we might call “Ordinary Time” – the day-to-day routine of work and family life, punctuated by those special moments, the highs and lows of life, most of which just happen when they happen, not particularly according to any calendar. Yet the calendar is always there, and never more obviously than on this day, when the simple act of changing the calendar makes us stop and wonder what it’s all about. Sometime in the mid-1970s when I was a graduate student in New Jersey, talking with a friend a day or two before New Year’s, I recall saying something to the effect that, even if I had to be alone on New Year’s Eve, I would still look forward to it because New Year’s is always about hope. A New Year is always an invitation to hope. Hope is everyone’s response to the desire for happiness, which is in everyone’s heart. Hope keeps us from giving in to discouragement and sustains us in times of difficulty. It takes us out of ourselves and unites us with others, who also live in hope, despite life’s daily difficulties and tragedies. Our hope is founded on Jesus Christ, whose birth some 20 centuries ago is the very basis for our calendar. When the fullness of time had come, God sent his Son, born of a woman, born under the law [Galatians 4:4]. Jesus was born of a woman – Mary, the Mother of God and the Mother of the Church. He was born under the law – a member of the Jewish People, circumcised on the eighth day of his life, in fulfillment of God’s covenant with his Chosen People. God’s entry into the world in Jesus – born to a particular mother, of a particular nation, in a particular place, and at a particular time in human history – has (as the Christmas liturgy says) given our immortal nature immortal value. It has realigned all of time and given all of history a new, more hope-filled meaning, giving us a hope for the future which we would never otherwise have had. Time is always precious – precisely because we have such a limited supply of it. By making himself a part of our time, however, God has turned our limited time on earth into a time of unlimited opportunity. So as we begin a new year, we do so not in fear and desperation, but with the hope that is truly one of God’s great Christmas gifts to us. As he himself has lived a fully human life among us in our time, he now enables us to live and love as he himself does – and so share both now and for all eternity in the divine life he has so freely shared with us.